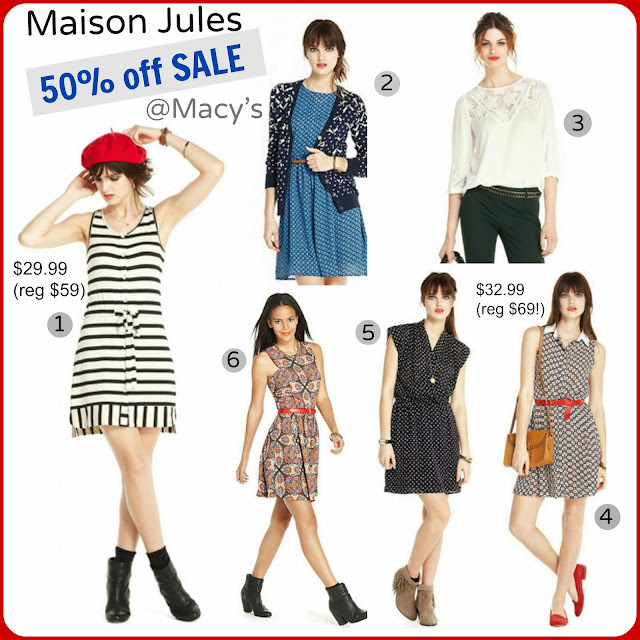 Tracy's Notebook of Style: Maison Jules at Macy's is 50% off selected dresses + tops!! Maison Jules at Macy's is 50% off selected dresses + tops!! I have patiently waited for the Parisian-inspired Maison Jules Collection at Macy's to go on sale. The wait is now over and I never expected them to be found at 50% their cutest dresses! I checked in-store today and thankfully my size was sold out, because the online prices are cheaper. The new look book for the holiday collection is now available for your viewing pleasure and I already have my eye on a few things..when they go on sale of course! Have you shopped this collection yet - any favorites? Shop the entire collection here + go to sales/clearance on the left. So many items to choose from! We don't have Macy's here, but I love these looks! I may have to shop my closet a bit to try and replicate some of these outfits. That is too bad since the collection is so European. I love the casual chic looks of all the pieces and that dress you chose is so cute! This is a great collection! Really love the stripe dress! I agree, this is a great collection, especially impressed that Macy's is carrying the line! The stripe dress is so French and modern. Does anyone know how this line runs for sizing? True to size? Thanks for your help!